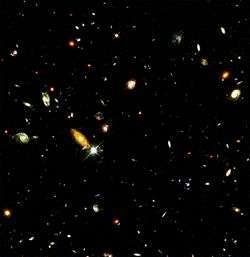 Galaxies in the Hubble Deep Field. Extragalactic astronomy is the branch of astronomy concerned with objects outside the Milky Way galaxy. In other words, it is the study of all astronomical objects which are not covered by galactic astronomy, and is considered the next level of galactic astronomy. As instrumentation has improved, more distant objects can now be examined in detail. It is therefore useful to sub-divide this branch into Near-Extragalactic Astronomy and Far-Extragalactic Astronomy. The former deals with objects such as the galaxies of the Local Group, which are close enough to allow very detailed analyses of their contents (e.g. supernova remnants, stellar associations).